In Oregon, there are treasures everywhere! Kevin Barron and his family learned about geocaching from a Parents magazine article in 2003 and gave it a try. 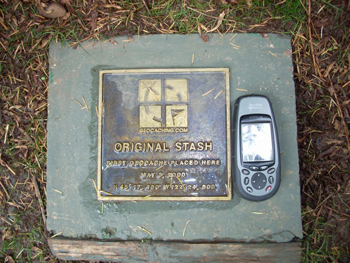 They put their zip code into the geocaching Web site and found that there were 10 sites within 2 miles of their Oregon home. “We found four of six we looked for that first night out and have been hooked ever since,” Barron says. Barron likes the hobby so much, he even set up a cache of his own that people can find. He prefers using a dedicated GPS unit – it is more rugged and accurate than the units found in cell phones – and reminds people that it isn’t a competition, but something to do to explore.  Officials from Groundspeak, a Web development company that runs the geocaching Web site, they say since September 2000, the number of caches have grown from 75 in Oregon, to more than 1 million worldwide. They also estimate that between 3 and 4 million people actively take part in the hobby. It all started in May 2000, when David Ullmer, a computer consultant wanted to test the accuracy of the recently opened to the public GPS system. He placed the first geocache at N 45° 17.460 W 122° 24.800 and then put a message on the Internet. Geocaching was born. Now, someone like me, with an iPhone and a 5-year-old daughter, can punch in a ZIP code and find 10 urban caches near my home in Canby, Oregon. My first adventure into geocaching was fun, and at the end of the day I found one of the two caches we looked for. The one we found, ironically, was taped to the back of a ‘No Trespassing’ sign right off a public sidewalk. There is usually a hint – in this case it said there were “slim pickings” – which can help you find the hidden treasure. This cache didn’t have anything in it, but did have a sign up sheet, so you can show people you found the cache. We left some stickers in the cache for the next person, which is a tradition, if you take something, you leave something. Barron says he has seen many parts of Oregon that he normally wouldn’t have seen if it wasn’t for his hobby, and even with his children now older, he still goes out exploring. About the geocaching: It’s a hide and seek treasure hunt using a handheld GPS device and your wits. 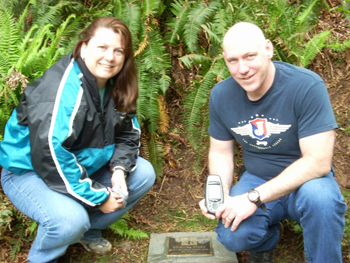 There are more than 1 million geocaches worldwide and Oregon is home to several thousand. Whether you want to sign up for an account on www.geocaching.com or simply use an iPhone application, geocaching is a unique way to discover areas around Oregon. The caches range in difficulty from very easy to hard, in both the level of investigation needed to find them and the effort you have to put in to get there. Some are urban caches which are simple walks around a residential neighborhood and others can be found in state parks. What to bring: First off a GPS is a requirement, whether that is in your phone or a handheld device. Secondly, make sure to wear weather appropriate clothing and depending on the type of cache you are looking for, make sure you always bring enough water, and comfortable shoes. Also, don’t forget your sense of discovery and adventure. Season: You can geocache year round, but Fall and Winter in Oregon can be rather wet and cold. 1. If you take something from a cache, replace it with something else. 2. Cache in, trash out. If you see trash, pick it up. 3. Always get permission if you find a cache is on private property. 4. Always let someone know where you are going, especially if the cache is in a wilderness area or state park. 5. Don’t put yourself or others in harms way. 6. Caches are intended to be enjoyed by people of all ages. 7. Review cache requirements and guidelines before heading out. 8. Pack any needed supplies such as water, food, and extra clothing. 9. Make sure you have extra batteries. 10. It never hurts to carry a compass. Story by Patrick Johnson, a free-lance writer based in Canby, OR. Photos courtesy of Kevin Barron. 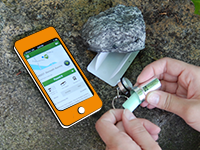 Geocaching has never been easier to share or take along on a spontaneous adventure. The official Geocaching Intro apps for Android, iPhone and Windows Phone serve up beginner geocaches. The app is loaded with helpful advice, tips and videos to turn muggles into geocachers in just a few clicks. The apps offer your friends everything they need to launch on a geocaching adventure. Use the app to search for Traditional geocaches, navigate to their locations and log finds. Now when friends ask about geocaching, you can say, “download the official Geocaching intro app, and I’ll show you all about it.” Or say something even wittier, maybe even add a joke. Your friends like jokes. If you’re a Geocaching Premium Member the intro app offers even more features, like access to all Traditional geocaches regardless of terrain or difficulty, including Premium Member Only Traditional caches. Download the app for your phone now, and begin a geocaching adventure anywhere. Heading out for some adventures? So are the Heffleys! Greg, Rodrick, Manny, Mom, and Dad have hit the road, but they’ve lost a few things along the way. 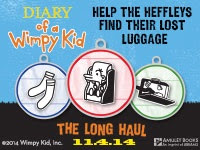 Request a Wimpy Kid trackable while supplies last to help their lost luggage find its way home! There are six thousand Wimpy Kid trackables heading to caches all across North America. If you find one, keep it moving by putting it in another geocache. And make sure you log it to see how far your trackable goes! What adventures will the Heffleys get into? Find out when Greg and his family hit the road in author-illustrator Jeff Kinney’s latest installment in the phenomenally bestselling Diary of a Wimpy Kid series.Diary of a Wimpy Kid: The Long Haul arrives in stores on November 4, 2014, and is available for pre-order. Want to make sure you’re the first to know about Wimpy Kid news, games, events, sweepstakes, and more? Sign up for the Wimpy Kid newsletter here.